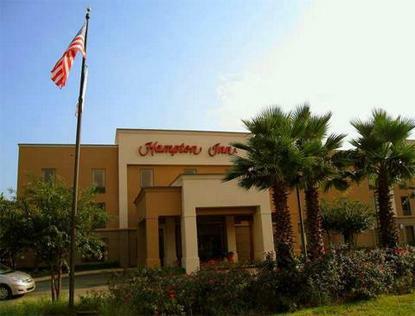 The Hampton Inn Niceville/Eglin AFB is located at the water's edge of the Rocky Bayou in Bluewater Bay of Niceville. We're only 7 miles to Eglin Air Force Base's East Gate and a short drive to the beautiful white beaches and emerald waters of the Gulf of Mexico via the MidBay Bridge. The Okaloosa Regional Airport is 8 miles via taxi or rent-a-car. Amenities include Hampton's ''On The House'' hot breakfast, complimentary high speed internet, interior corridors and an outdoor pool. All of our rooms have a frige and microwave, iron and ironing board, hairdryer, coffee maker, and cable TV with HBO. Local dining includes Giuseppi's Wharf, Beef O'Brady's, Ruby Tuesday, La Bamba and the Boathouse Landing. There are several award winning golf courses with a short distance of the hotel.